Nearly as potent and ballsy as the gut-rot moonshine being peddled in the film, ‘Lawless’ is clearly a Nick Cave product. It would take a man of his trademark darkness and viciousness, in partnership with filmmaker John Hillcoat (who also directed the 2005 Cave-written film ‘The Proposition’ and 2009’s bleak ‘The Road’), to craft something as bittersweet and edgy as this. As you’d expect from that kind of artistic pedigree, ‘Lawless’ is a well-oiled production that knows exactly what kind of film it is: a classic revenge tragedy with Tommy-guns and fiddles in the dustbowl South. ‘Lawless’ follows three brothers, infamous for their liquor-making, during prohibition in 1930s America. Forrest (Tom Hardy – ‘Inception’, ‘The Dark Knight Rises’) is stoic and a mad-dog fighter; Howard is simple and, frankly, kind of bland; Jack (Shia LaBeouf – ‘Transformers’, ‘Indiana Jones and the Revenge of the Lousy Screenplay’) is the gentle darling of the three – and the centremost character. They end up running their hooch all over the south, attracting the attention of the corrupt Special Deputy Charley Rakes (Guy Pearce – ‘The Proposition’, ‘LA Confidential’) and the curiosity of the pretty and impressionable Bertha (Mia Wasikowska – ‘Alice in Wonderland’, ‘Jane Eyre’). In the traditions of ‘The Proposition’, Hillcoat doesn’t pull punches. The beatings come thick, fast and without mercy. We’re grateful because these bursts of action, rising steadily into the final act, tend to be the most interesting elements of the film. That, and Tom Hardy – who may well be one of the best actors on the rise right now. Hardy, who mumbled his way through ‘The Dark Knight Rises’ as masked anarchist Bane, also gets to grunt and speak through locked jaws in ‘Lawless’. It’s used to great effect however; his casting is spot-on as the silent hulking brother. When he lays his fists into someone, you feel it. When he speaks, you know it’s important. It’s one hell of a performance – understated, at times funny, but absolutely memorable and arguably the best role in a film of strong performances. Shia LaBeouf may get a hard rap for some of his paycheck roles—but he shows why he’s a star here. It’s nice to see him embrace a character with inherent vulnerability, rather than some knucklehead hero. His performance has range and finesse. Likewise, the always outstanding Guy Pearce is given plenty of scenery to chew on; I’d say he overacts here – but as a villain, you’ll hate him with passion. It’s what you want. 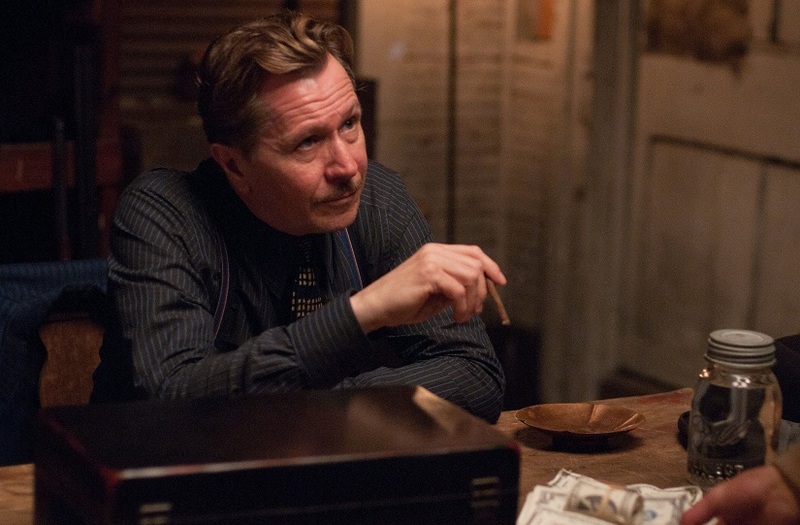 Small roles from Gary Oldman (‘The Dark Knight Rises’, ‘Tinker Tailor Soldier Spy’), who kills me with his glances, and Jessica Chastain (‘The Help’, ‘The Debt’) are also stand-outs. Adding Gary Oldman to your movie instantly gains you an extra star in our ratings system. The soundtrack is another Nick Cave creative offshoot—though in partnership with long-time musician and friend, Warren Ellis, performing as The Bootleggers. Keep your ears peeled for Mark Lanegan and Emmylou Harris numbers in this toe tapping rural set; it’s chock-full of wild fiddles and long, lonesome ballads, perfectly capturing the off-the-path setting. As fine as these performances are, there’s something a little worn about the overall production—like the screenplay treads too closely to a path we’ve seen before. Maybe that’s no bad thing, since there are a handful of mild twists to subvert things – and there’s a kind of fable-like quality to the story, reinforced by the brothers’ legendary status as invincible men in their tiny community. There’s also a feeling that, unlike the fireball intensity of ‘The Proposition’, ‘Lawless’ has been tamed for the masses. In doing so, it never quite attains that ‘classic’ film status; it’s pretty great – but not the masterpiece it strives to be. I think that’s fine; it’s a dirty hillbilly action movie that doesn’t talk down too much. I’m all for guys like Nick Cave and John Hillcoat being given a cinematic platform to reach a mass-market; this movie has plenty of integrity, if not sterling originality.